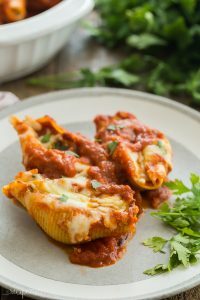 Ricotta Stuffed Shells Recipe - make ahead and freezer friendly! You are here: Home / Mains / Ricotta Stuffed Shells Recipe – make ahead and freezer friendly! Lightly grease a 9x13" baking dish with non-stick spray and spread 1 cup marinara sauce in the bottom. 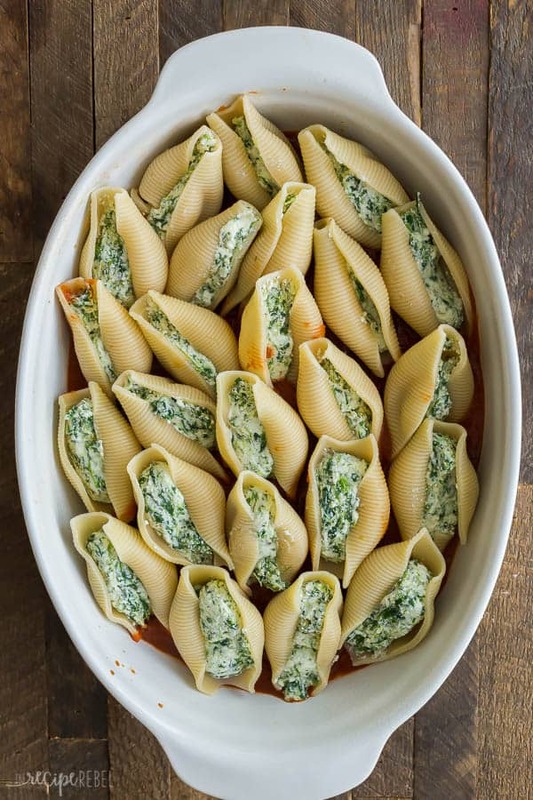 Divide Ricotta mixture evenly between shells and place in prepared pan. You might have to squish a little to fit, that's okay. Hi, do you know how well this would work if trying to make in small batches? I’m the only one in my household who can have cheese.. so I’d rather not have to make a whole 9×13 baking pan if I can prepare and place into smaller batches so that I can heat up a serving or two at a time. Yes, you can definitely prepare them in smaller batches! You will probably want to reduce the cook time, but that is all. You could even flash freeze them and store in a large freezer bag, then add sauce and heat just as many as you need. Can you freeze them without the sauce? You definitely can! I would probably freeze them with, just because it makes things super simple when you go to reheat but either way works great! You could even flash freeze them (individually) and then throw them in a large freezer bag. I’ve frozen mine individually and they are in a freezer bag. When I want to cook a few, how do I do it? Do I have to thaw them out, or cook frozen? Either way, can you tell me for how long and at what temperature? Thanks so much! It is probably easiest to thaw them and reheat, as they’ll cook more evenly that way. 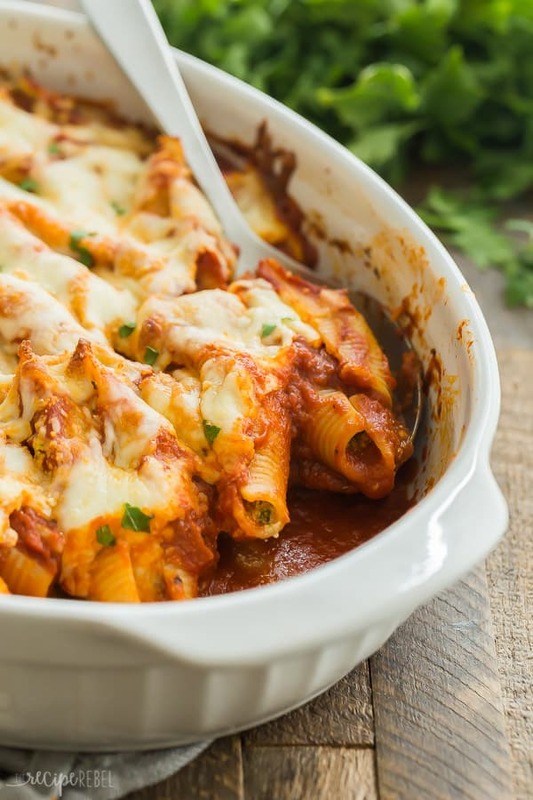 I would thaw in the refrigerator through the day, then add some sauce in pan, add the shells and add some additional sauce, then bake at 350 F for 15 minutes or until they are heated through. Looks delicious! Can this be made a day ahead, refrigerated, and then baked before serving? A meal the whole family enjoys eating! I make this all the time. Such a tasty recipe! I’ve sometimes used cottage cheese instead of the ricotta, and they are still delicious! This is an awesome weeknight meal. It’s in the monthly dinner rotation! 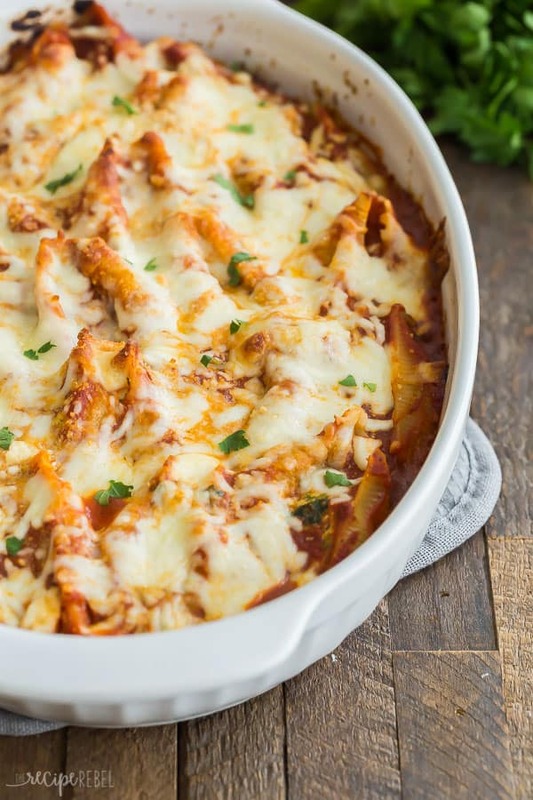 Oooh… we’ve been on a baked ziti kick and this looks like a nice change, but the same flavors so my son will approve. I’m so hungry just looking at. Are there people who don’t like things stuffed with cheese? I can’t believe it. This is the best recipe – I love that you can make it ahead. Freezer meals are awesome, especially when they have such great flavors! !